Let’s Bring Back Ham Salad! Who’s In? We Can Use This Extremely Healthy Recipe | Keep It Up, David! The reason I bring this up is because I no longer see ham salad around much anymore. Maybe it’s more popular in other parts in the country, but not in southern California. I don’t see it on menus, and I don’t see it in deli cases at fancy supermarkets, where pre-made chicken, egg, and tuna salads can all be found pretty easily. What happened to ham salad? I love ham. It’s delicious, and very lean, and did I mention delicious? 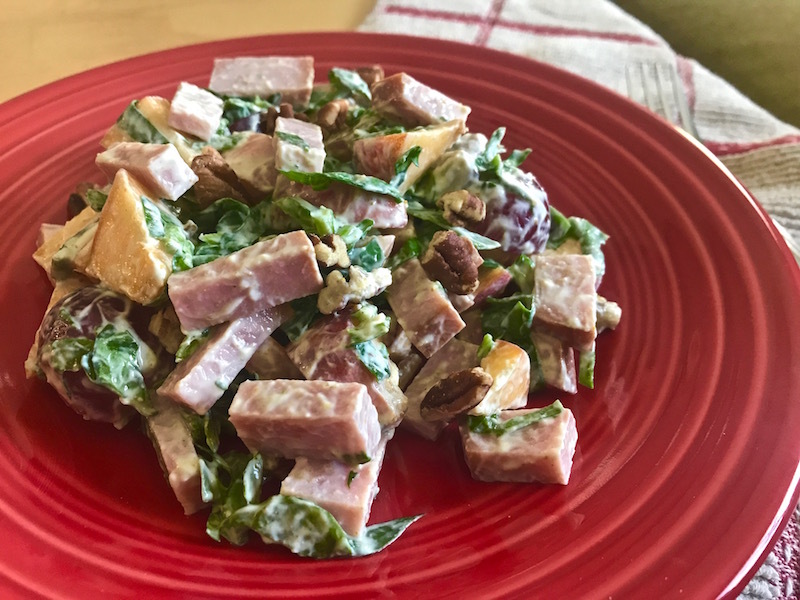 Let’s bring back ham salad! And I have the perfect recipe for the job. It’s light and flavorful, and without a single drop of mayonnaise – and you can enjoy a very generous portion for only 190 calories. Yup – 190 calories! 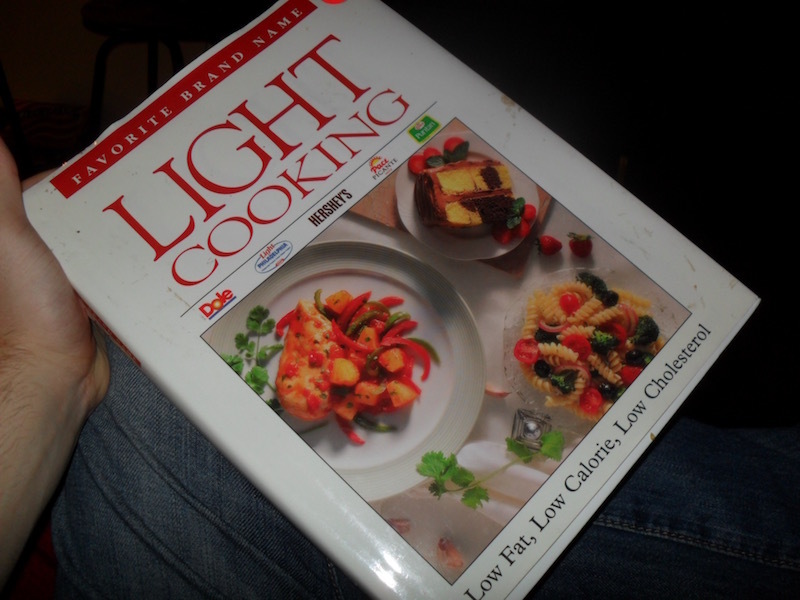 Here’s the funny thing: I don’t own this cookbook, and I don’t remember which of my friends does. I was going through old photos, and I took this photo on August 13, 2011, along with a photo of a recipe on the inside, and I no longer remember where I was or who let me look at their cookbook. So – if you’re one of my Los Angeles-area friends and this book is sitting on your shelf, speak up! 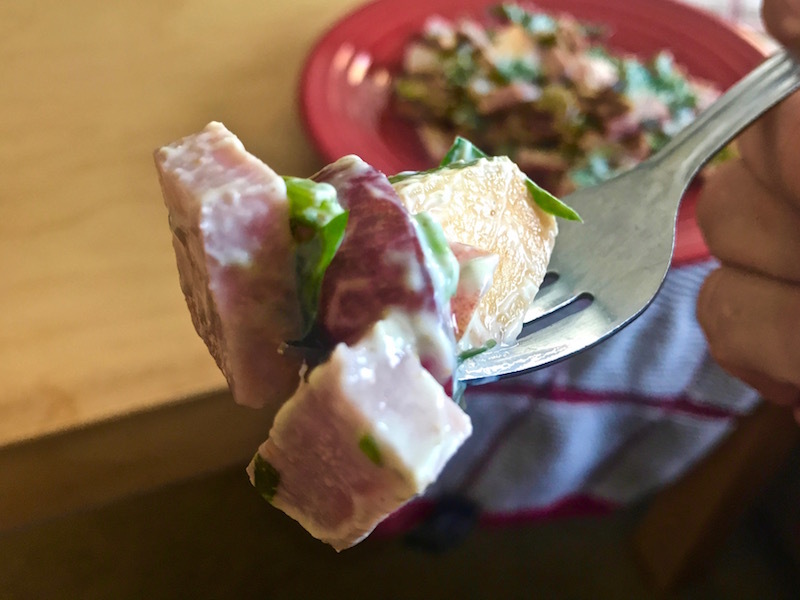 Here’s my recipe for Fruity Curried Ham Salad. Let’s start with the ham. You need 6 ounces of ham steak. 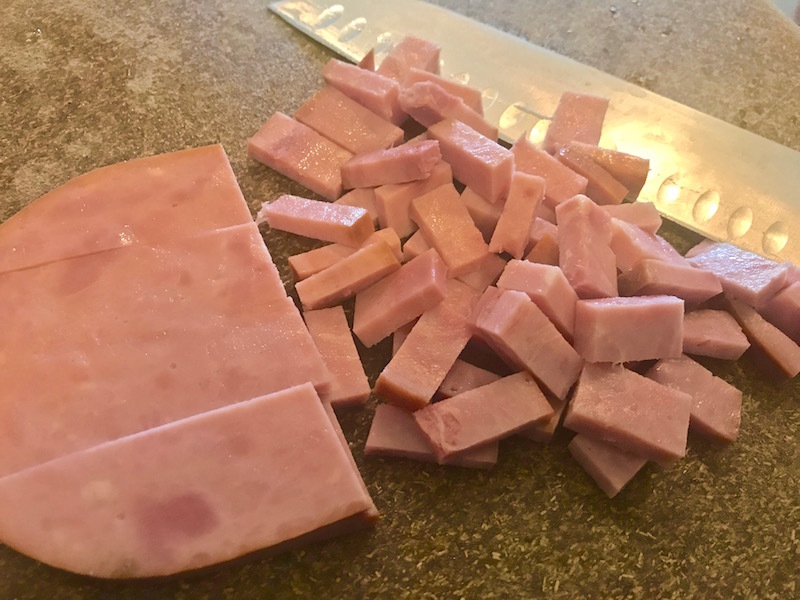 You can have someone at the service deli slice a ham steak for you, or, you can find ham steak pre-packaged in the meat cases, near the breakfast sausage and bacon. Chop it into pieces. It’s up to you how big or small you make the pieces. I like bigger pieces, because it feels more luxurious and rustic, but smaller pieces might work better if you plan on using this in sandwiches or wraps. RELATED: Check Out Oodles of Healthy Meal Ideas on My Recipes Page! The fruity part of this recipe comes from two different kinds of fresh fruit: peaches and grapes. 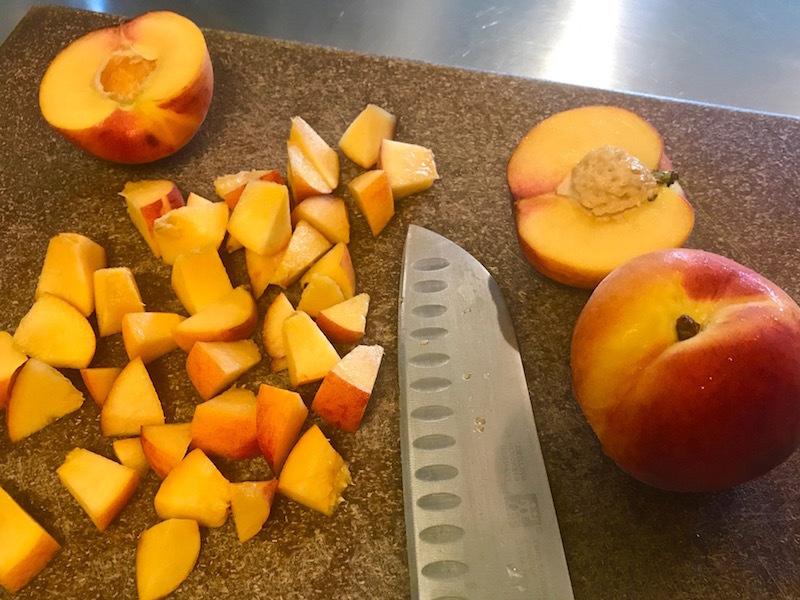 You need 2 peaches, chopped into pieces. I tried to make them roughly the same size as the ham chunks, so it’s all uniform. 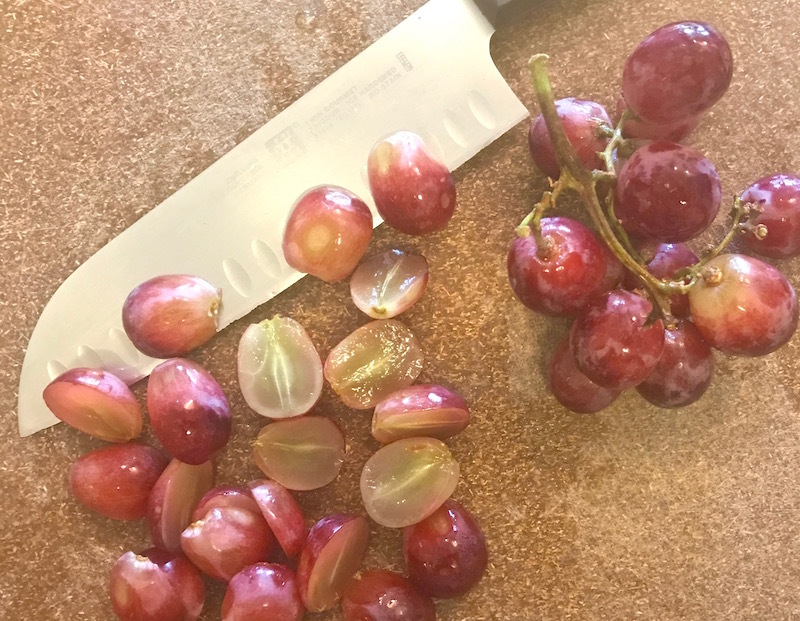 You also need 1 cup of grapes, halved. Use whatever tastes the best. The red ones were way sweeter than the green ones when I was shopping, so I went red. a few big handfuls of fresh spinach (about 4 cups), cut into thin ribbons. The fancy word for this is ‘chiffonade.’ This bulks up the salad, and adds lots of nutrients. 2 tablespoons coconut water. This thins the dressing out. 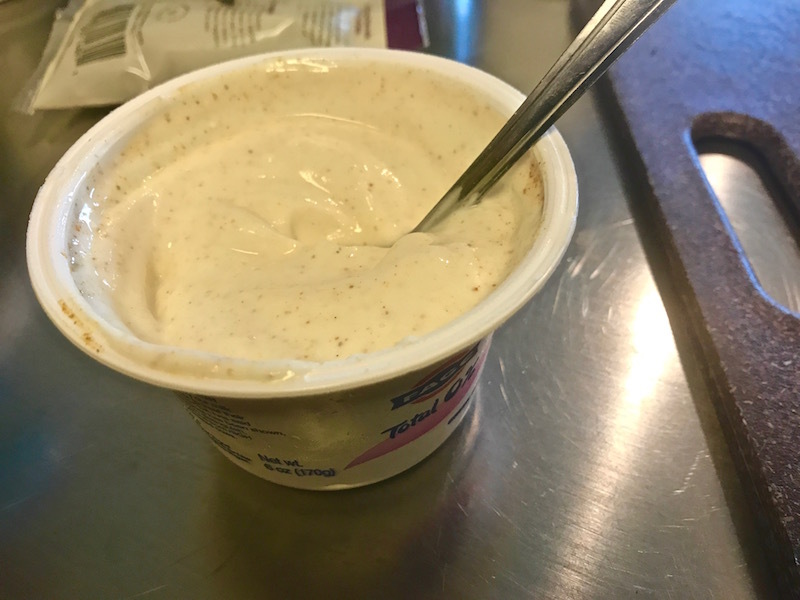 They sell yogurt in 6 ounce containers, so I was able to, very carefully, add the other two ingredients to that container, and just stir it up in there. Then add the dressing to the other ingredients, and you’re done! 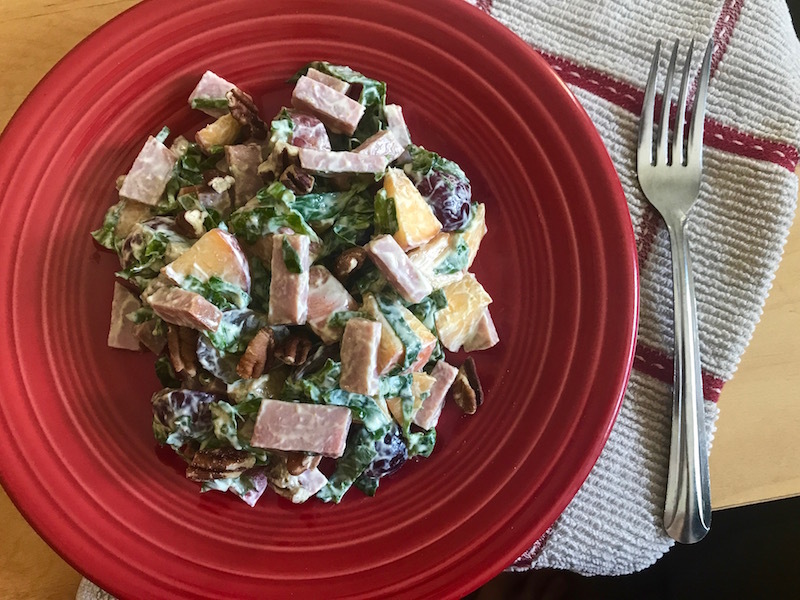 So many flavors and textures: sweetness from the fruit, spice from the dressing, saltiness from the ham, crunch from the walnuts. It’s very decadent, although with yogurt instead of mayonnaise, it’s very low calorie! This recipe makes four big servings. Each serving has 190 calories, 8 grams of fat, 17 grams of carbs, and 13 grams of protein. Are you with me? 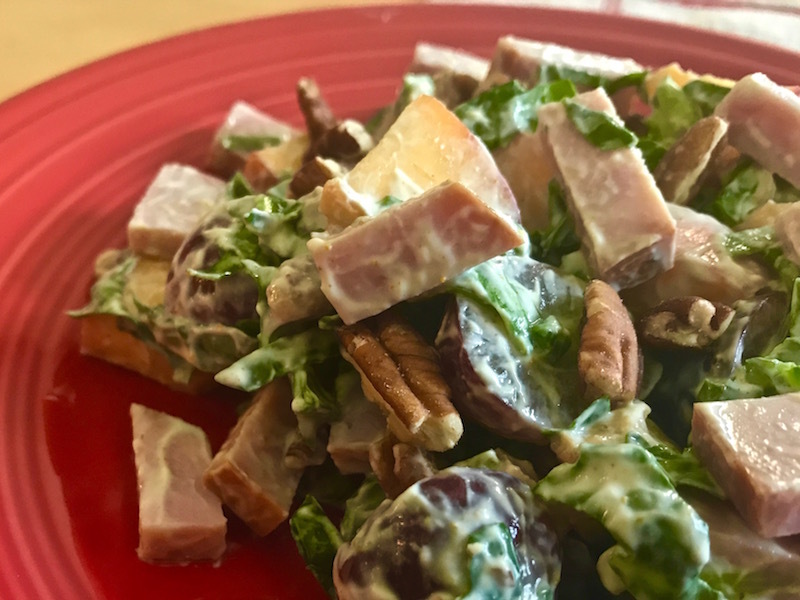 Let’s bring ham salad back! This entry was posted on Monday, May 15th, 2017 at 12:44 am and is filed under Uncategorized. You can follow any responses to this entry through the RSS 2.0 feed. You can leave a response, or trackback from your own site. this summer. What is the chopped greenery? Spinach! Thanks and I hope you enjoy. 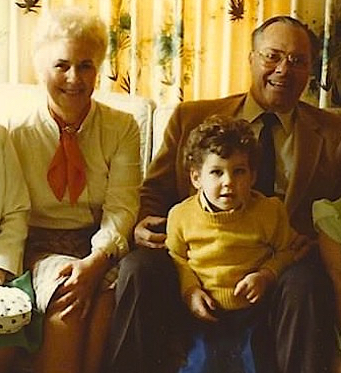 Oh, I love that picture of you with Gram and Gramps. You are sooo cute with all your curls!! Actually, I don’t remember Grandma making ham salad, but I can buy it locally in the specialty deli, and as in the above comment, the ham is ground with a little sweet pickle and mayo and more mayo. Your recipe looks DELICIOUS! How are the leftovers? Does this keep well or get watery? Looks delicious! It IS delicious! The leftovers didn’t last long in my fridge. Made it for lunch and ate the rest at dinner. But in that time frame, it held up beautifully! Not sure. I do it manually so I can customize the tweet.